“There are no good choices.” I remember saying that to my mother three years ago when we hit the first major decision point in what would become a long sequence of no-win decisions. My father had fallen again, crossing undeniably over the threshold to dependence. She was exhausted and sick. What should they do? They had some options, but it was clear that there was no inching back up the hill. It would be compromise and diminishment from now on. Gawande thus enters a larger conversation about the need for reform in end-of-life care. Dr. Ken Murray’s 2011 article “How Doctors Die,” for example, neatly summarizes the complicity of doctors, patients and “the system” in overtreating the dying. Katy Butler’s memoir, Knocking on Heaven’s Door, weaves her research into the medical device industry into the story of her father, who was kept alive by a pacemaker after a stroke, greatly prolonging his own suffering and straining her mother to the breaking point. Roz Chast’s graphic memoir, Can’t We Talk About Something More Pleasant, (reviewed here) was a finalist for the 2014 National Book Award. Perhaps, as Gawande suggests, we are reaching a turning point in the public conversation, reviving the ancient concept of ars moriendi for a modern age. Gawande contributes to this conversation his lucid, elegant prose and his extraordinary patience with the complex dilemmas people face in illness and aging. Gawande summarizes research and offers medical expertise, but mostly he tells stories—detailed, compassionate portraits of relatives, friends, patients, people he came to know through his research. Each one illustrates different mistakes and different possibilities for dying well. Never does Gawande romanticize any option, including aging in a traditional extended family, as his own grandfather did, dying at age 110. While there were beautiful aspects to his grandfather’s long old age, Gawande is also frank about the difficult family power dynamics involved. Likewise, after examining the origins of assisted living facilities in the 1980s, Gawande describes how such facilities can help people retain some autonomy but he also accounts fairly for their limits. Living with a daughter works acceptably for a man named Lou, but eventually the daughter reaches her limits and Lou has to move into assisted living. No solution is perfect. Some thought-provoking innovations offer promise, though. Gawande recounts how Dr. Bill Thomas, in an effort to improve the nursing home under his direction, brought in two dogs, four cats, 110 birds, plants, children, and a garden. Giving residents living things to care for produced astonishing results: “The lights turned on in people’s eyes.” In another facility, arranging residents in “pods” provides much-needed community. Despite innovations, medicine and institutions as a whole have not, thus far, had any particular “view of what makes life significant.” But that’s what we need to find, argues Gawande, and of course the answer is somewhat different for everyone. What does he advocate? Better training in geriatric medicine for all doctors, not just specialists. Greater emphasis on palliative care and hospice options, which turn out, as research proves, to be better medicine anyway, producing not only better quality of life but typically extending life longer than aggressive treatment options would. But most of all, Gawande advocates talking—families talking together, and doctors talking with patients and families to discern what matters most to each person. “When should we try to fix and when should we not?” That’s the main question we haven’t been asking. Even at the point where we might decide, in a particular case, not to “fix,” there are still important questions to be asked about how medicine can assist the patient in making the most of each day left. Unfortunately, as Gawande notes, these conversations take time and skill, and doctors are not usually compensated for them. Focusing on what is most significant for a person, even as life ebbs, gives people time to die as well as possible, with attention to relationships and to spiritual work. Gawande speaks of his patients’ spiritual lives only occasionally, always with respect but not in much detail. He himself was raised Hindu, we discover in the final pages. Readers of the book with an interest in the spiritual aspects of dying might wonder how clergy could help with the sort of end-of-life reforms Gawande advocates. At the very least, I imagine clergy could enter into these crucial conversations, within families and between families and doctors, helping people in moments of bewildering distress reorient to their deepest priorities. To depend only on doctors to deal with these profound matters seems another mistake of overmedicalizing. But that’s a topic, perhaps, for another author to consider. Gawande, author of three previous books, is a bestselling author for a reason—his writing is lovely and clear, his voice persuasive yet vulnerable. He admits his own past shortcomings as a medical professional, and we see his evident anguish over patients dying too young or aging in situations that cause them distress. Near the end of Being Mortal, Gawande finally gets to the story of his own father, who was diagnosed with a spinal cord tumor in his 70s. As the tumor gradually limits his father’s mobility, the family’s decisions are not always right—at one point, they opt for a radiation treatment they later regret. Gawande thus illustrates how difficult navigating these decisions can be, even for him and his parents, all of whom were doctors. 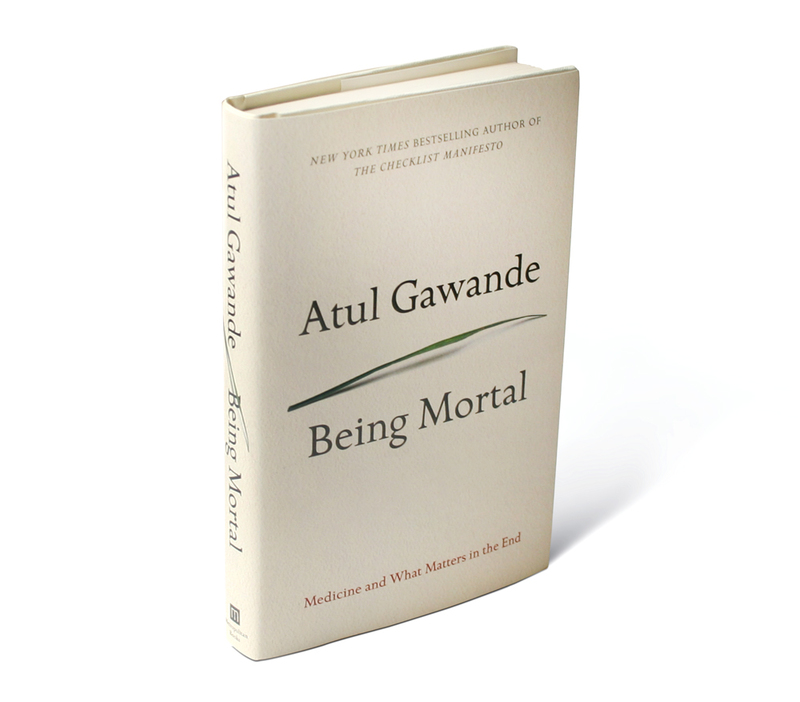 In the end, Gawande describes movingly his father’s last days at home, under hospice care. I read this book for the first time while both my parents were still alive. In the past month, I’ve lost them both. My father died in April after an excruciating three-year decline, my mother on May 6 after a precipitous drop from independence to hospice within four weeks. Looking back, I think we made the best decisions we could at each point. The doctors and nurses we encountered, thankfully, seemed attentive to the sorts of priorities Gawande emphasized. Even so, no one should imagine we can take control of the dying process. Reading this book again now, I appreciate that Gawande never claims we can. He fully acknowledges that aging is unpredictable and characterized by limitations, loss, and grief. The same is true for any terminal illness. We are not in control, he admits, but “we are not helpless either.” His call is for honesty about that, and a recalibration of medical practice so that it serves, to the end, what patients—in their human complexity—deem most important.